Lackluster sales at South Korean carmakers is taking a toll on local parts suppliers, with a growing number of them recording operating losses and seeking debt workout programs. Amid concerns that struggles at local carmakers would have a profound impact on local small and midsize parts suppliers, the government has stepped in to provide special credit guarantees worth 1 trillion won. According to data from the Korea Auto Industries Cooperative Association, out of 89 listed first-tier suppliers, 42 posted operating losses in the first quarter of this year. 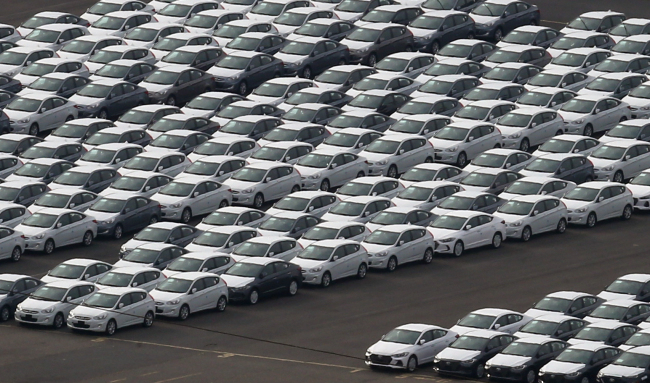 The amount of loans by companies in the auto industry has snowballed 30 percent to 31.1 trillion won ($27.2 billion) in this April-June period from 24.1 trillion won in 2013, data from the Bank of Korea showed. Following requests from auto parts suppliers for the government to provide some 3.1 trillion won in funding, the Finance Ministry last week announced the Korea Credit Guarantee Fund and Korea Technology Finance Corporation will offer 1 trillion won in special loan guarantees. The government will guarantee 90 percent of the loans taken out by companies, while lowering the guarantee fee rate to 1 percent, about 0.3 percentage points less than the average rate. Based on a survey conducted on 851 first-tier parts suppliers, the KAICA requested the Ministry of Trade, Industry and Energy for 3.1 trillion won in financial support, among which 1.7 trillion won would be used to extend loan payment, 1 trillion won for investments in equipment and 400 billion won for research and development. In case of Hyundai Motor, South Korea’s leading auto firm, its first-tier supplier Leehan, an engine air filter maker, filed for a debt workout program, followed by Dynamec, Gummoon Industry, and E-won Solutech. Ahead of the release of Hyundai’s quarterly earnings shock on Thursday, Hyundai Motor Group Chief Vice Chairman Chung Eui-sun held a meet up session with some 10 leaders of Hyundai and Kia’s first-tier suppliers last week in efforts to encourage its partners, the company said. “The parts industry faces hardships due to sluggish car sales and complex uncertainties, but we must gather strength to leap forward,” Chung said. Hyundai Motor posted a sharp 76 percent on-year decline in operating profit, totaling 288.9 billion won in the July-September period, data from the company showed. Experts have also pointed to South Korea’s strong-arm labor union demanding raises despite shrinking revenue as a factor leading to the crisis in the auto industry. “Unions pushing for wage hikes is a factor weighing on the situation. Automobile production and revenue at Korean automakers have declined in the recent years, but wages of workers at auto factories are higher compared to those in other industries,” said professor Kim Yong-jin of Sogang University, who also heads the Korean Academy of Motor Industry. To survive in the future auto industry, analyst at Samsung Securities and Investment Im Eun-young emphasized local auto parts suppliers need to become top notch market. “Global IT firms are racing to acquire auto parts makers, which is leading to an oligopoly. South Korea must create a No.1 parts maker, even if that means assigning a specific item,” Im said.